In a world where obesity has now reached epidemic proportions, a thorough understanding of the underlying causes of the problem is essential if society, public health initiatives and government policies are to successfully address the issue. The obesogenic environment describes all the possible influences that our environment presents which encourage overweight and obesity in individuals and populations. Beginning with an overarching introduction to obesity and its implications for health and wellbeing, the book will move on to consider such crucial areas as eating behaviours and food environments, physical activity and the environment, the urban environment, methods, policy and future research directions. This groundbreaking book brings together for the first time the knowledge of experts with backgrounds in nutrition and dietetics, policy, epidemiology, environmental sciences, medical sciences, town planning and urban design, transport, geography and physical activity in order to offer a multidisciplinary approach to public health, suggesting new and exciting ways to shape our environment to better support healthful decisions. 1. An international perspective on obesity and obesogenic environments (WPT James, R Leach & N Rigby). 1.1 Introduction: the emergence of obesity. 1.2 The magnitude of the problem. 1.3 The basis for the current underestimated burden of obesity. 1.4 Individual susceptibility to weight gain and the persistence of obesity. 1.5 The environmental basis for the obesity epidemic. 2. Towards transdisciplinary approaches to tackle obesity (Tim G Townshend, Louisa Ells, Seraphim Alvanides, Amelia A Lake). 2.1 The focus on interdisciplinary research. 2.2 Defining modes of interdisciplinarity. 2.3 The complexity of obesity. 2.4 The challenge of interdisciplinary understanding. 2.5 Interdisciplinary policy and practice. 3. Walkabilility, Neighbourhood Design, and Obesity (Jennifer Robertson-Wilson and Billie Giles-Corti). 3.4 Linking neighbourhood design aspects of walkability to obesity. 3.6 Urban sprawl, geographic location and obesity. 3.7 Other design features and obesity. 3.8 Neighbourhood design as a moderator. 3.9 Summary of findings and future directions in research on the impact of neighbourhood design and/or walkability and obesity? 4. Availability and accessibility in physical activity environments (Andy Jones & Jenna Panter). 4.2 The concept of availability and accessibility. 4.3 Perceived and objective measures of the physical activity environment. 4.4 Comparing perceived and objective measures. 4.6 Equity of access and facility provision. 5. Defining and mapping obesogenic environments for children (Kim L. Edwards). 5.2 Advantages of mapping obesogenic environments in children. 5.3 How to map obesogenic environments – data representation. 5.4 Problems with spatial data. 6. Objective measurement of children's physical activity in the environment :UK perspective (Ashley Cooper & Angie Page). 6.1 UK policy and research context. 6.2 A brief review of current studies in the United Kingdom. 6.3 Objective measurement in physical activity research. 7. Physical activity and environments which promote active living in Youth (US) (H. Mollie Greves Grow, Brian E. Saelens). 7.3 School and child care. 7.5 Conclusions and future research. 8. Active travel (Roger Mackett). 8.1 The potential for active travel. 8.2 Trends in active travel. 8.3 Barriers to active travel. 8.4 Overcoming the barriers to active travel. 8.5 Policies and measures to increase the volume of active travel. 8.6 The effectiveness of policies and measures to increase the volume of active travel. 9. Greenspace, obesity and health: evidence and issues (Caroline Brown). 9.2 Green space, health and obesity. 9.3 Green space, obesity and food. 9.4 Green space and physical activity. 9.5 Green space and children’s health. 9.6 Green space provision and policy. 10. Eating behaviours and the food environments (K Ball, D Crawford, A Timperio, J Salmon). 10.2 Which eating behaviours influence obesity risk? 10.3 What do we know about the influence of the food environment on eating behaviours? 10.7 How should we interpret existing evidence? 10.8 Defining the neighbourhood environment. 10.9 Conclusions and future research directions. 11. Food policy and food governance - changing behaviours ( A Lake & J L Midgley). 11.2 Dietary guidelines and recommendations with reference to obesity prevention. 11.3 Individual versus the environment. 11.5 Food provision and food access. 11.6 Future for food policy. 12. Neighbourhood histories and health: social deprivation and food retailing in Christchurch, New Zealand, 1966 to 2005 ( Jamie Pearce & Peter Day). 13. Environmental correlates of nutrition and physical activity: moving beyond the promise (FJ van Lenthe and J Brug). 13.2 Environmental correlates of physical activity and diet: underlying reasons for promising findings. 13.3 Environmental correlates of physical activity. 13.4 Environmental correlates of diet. 13.5 Moving beyond the promise: a research agenda. 14. 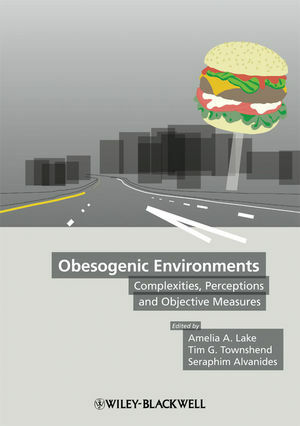 Obesogenic environments: challenges and opportunities (Seraphim Alvanides, Tim G Townshend, Amelia A Lake). "This book considers environmental factors which encourage overweight and obesity, including those having an impact on physical activity, food intake and eating behaviour".